In 1940 the American psychic healer and prophet Edgar Cayce predicted that Atlantis would 'rise again' in 1968 or 19969. So, in 19968, when it seemed that the site of the world's most famous lost land had finally been located in the eastern Mediterranean, news that underwater vast building off the Bahamas shook Atlantist everywhere. The question of Atlantis was reopened. Could this be Poseidia, described by Cayce as the 'western' section of Atlantis? Were Plato and the other Atlantists right after all when they placed their lost civilization way out in the Atlantic Ocean? In 1968 two commercial pilots flying over the Bahamas spotted what appeared to be several underwater buildings coming to the surface. The pilots made their sightings just off the coast of Bimini and photographed the underwater formations from the air. Their discovery was immediately hailed by some as the fulfillment of a 28 year-old prophecy concerning the reappearance of Atlantis. Indeed one of the pilots had been keeping a lookout for underwater structures while flying his regular assignments because he believed Atlantis was about to reemerge from the Atlantic in this very area. The man concerned is a member of the Association for Research and Enlightenment, an organization based in Virginia Beach, VA, which is dedicated to the study of the teachings and "psychic readings" of the late Edgar Cayce, the "sleeping prophet" and psychic healer. "Poseidia will be among the first portions of Atlantis to rise again. Expect it in ''68 and '69; not so far away!" 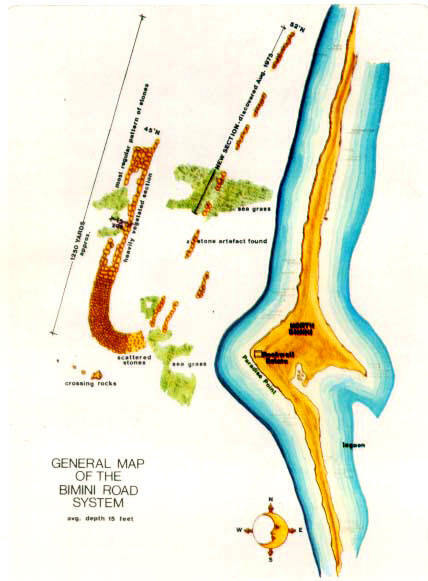 Map of Bimini Road drawn after aerial and underwater surveys carried out by the Poseidia 75 expedition, sponsored by the A.R.E. The road is magnified to approximately twice its actual size in relation to the island of Bimini. Shaped roughly like a letter J, it is some three quarters of a mile long and composed of huge stone blocks, often 15 feet square. On this map, the X marking the discovery of a stone artifact relates to a fragment of what appeared to be tongue and groove masonry discovered on the Poseidia 75 expedition by one of its member - Dr. David Zink. "Other underwater ruins have subsequently been found near other Caribbean islands, including what appears to be an entire city submerged off the coast of Haiti, and still another at the bottom of a lake. What appears to be an underwater road (or perhaps a series of plazas or foundations) was discovered in 1968 off north Bimini beneath several fathoms of water. From these numerous findings, it would appear that par of the continental shelf of the Atlantic and Caribbean was once dry land, sunk or flooded during a period when man was already civilized". Not everyone accepts these underwater features as being of man-made origin. The so-called "Bimini road" is dismissed by skeptics as nothing more than beach rock that just happens to have produced an unusual effect. Berlitz and Dr. Manson Valentine, the American archaeologist and oceanographer who discovered the "road", do not agree. "It should be pointed out." writes Berlitz, "that beach rock does not form great blocks which fit together in a pattern, that haphazardly splitting rock does not make 90- degree turns, nor does it normally have regularly laid-out passageways running between sections of it. Nor, above all, are 'natural' beach rocks, lying on the ocean floor, likely to be found supported by stone pillars precisely placed beneath them!" Other sightings made off Bimini, at distances up to 100 miles from the shore, include what appear to be vertical walls, a great arch, and pyramids or bases for pyramids under the sea. some 10 miles north of Andros, another island in the Bahamas, pilots have photographed formations on the seabed that look like great circles of standing stones, reminiscent of Stonehenge. Off the coasts of eastern Yucatan and British Honduras seemingly man-made roads stretch far out to sea, and off Venezuela a 100-mile 'wall' runs along the ocean bottom. However, geologists have declared many of these to be natural features, and deem the Venezuelan wall "too big to be considered man-made". According to Berlitz, the Russians have explored an underwater building complex covering over 10 acres of the sea floor north of Cuba, and the French bathyscape Archimede has reported sighting flights of steps carved in the steep continental shelf off northern Puerto Rico. Do these intriguing finds indicate that Atlantis was, after all, in the Atlantic? it seems we must keep an open mind until they have been investigated more thoroughly. Meanwhile, let us take a fresh look at the Atlantic Ocean to see if the theory of continental drift might still leave room for a missing continent there. When a computer was used to reassemble the continental jigsaw, the fit across the Atlantic was found, with some adjustment, to be fairly satisfactory. But that picture does not take account of a fascinating underwater feature known as the mid-Atlantic Ridge. This mountainous ridge, nearly two miles high and hundreds of miles wide, runs in an S-curve down the Atlantic midway between the Americas and Africa and Europe, following the contours of those continents and marking its course above water with a number of islands, such as the Azores, Ascension Island, and Tristan da Cunha. As early as 1883 Ignatius Donnelly suggested that the mid-Atlantic Ridge was a remnant of Atlantis. But most modern geologists and oceanographers consider that, far from being the relic of a continent that sank beneath the sea, the ridge was forced upward from the ocean floor, probably by volcanic activity. One theory is that as the continents drifted apart they produce a huge fault line that is a center of earthquake and produce a huge fault line that is a center of earthquake and volcanic action. Some of the earth's molten center has erupted through this crack and built up into a ridge, even rising above the waves in several places. However, there is evidence that this explanation may have to reviewed before too long. A diver taking part in A.R.E.s Poseidia 75 expedition to Bimini in the Bahamas examines an encrusted marble column found about a mile south of the Bimini Road. 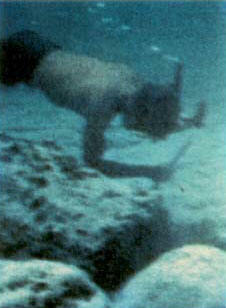 In 1968, what appeared to be a vast underwater road was discovered off Bimini, and the next year the columns, of which this is one, were found. Seabed cores taken from the mid-Atlantic Ridge in 1957 brought up freshwater plants from a depth of two miles. And in one of the deep valleys, known as Romanche, sands have been found that appear to have been formed by weathering when that part of the ridge was above water level. Thus, the occurrence of light-colored granitic rocks may support an old theory that a continent formerly existed in the region of the eastern Caribbean and that these rocks may represent the core of a subsided, lost continent." 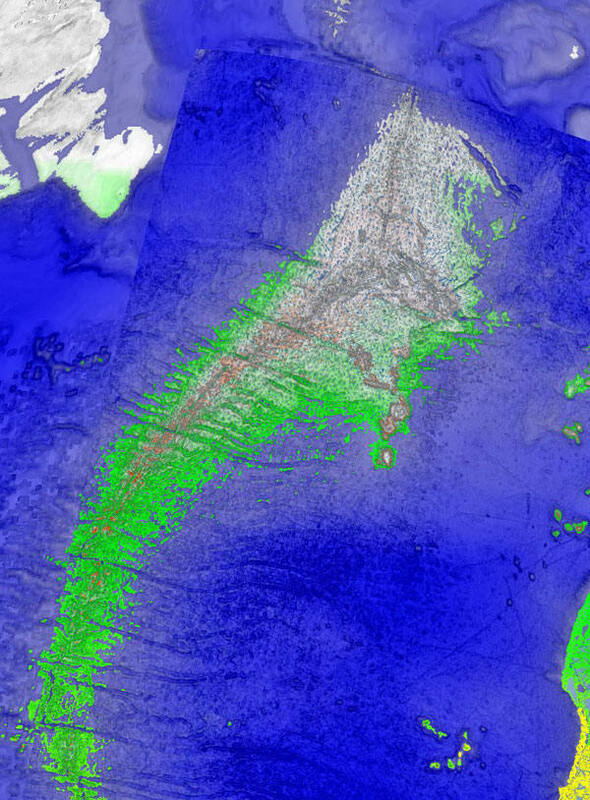 "Although they make no such fanciful claim from their results as to have discovered the mythical mid-Atlantic landmass, an international group of oceanographers has now convincingly confirmed preliminary findings that a sunken block of continent lies in the middle of the Atlantic Ocean. The discovery comes from analyzing dredge samples taken along the line of the Vema offset fault, a long east-west fracture zone lying between Africa and South America close to latitude 11� "N". The report goes on to state that in 1971 two researchers from the University of Miami recovered some shallow-water limestone fragments from deep water in the area. Minerals in the limestone indicated that they came from a nearby source of granite that was unlikely to occur on the ocean floor. More exhaustive analysis of the dredge samples revealed that the limestones included traces of shallow-water fossils, implying formation in very shallow water indeed, a view confirmed by the ratios of oxygen and carbon isotopes found in the fragments. One piece of limestone was pitted and showed evidence of tidal action. "The granitic minerals could thus have come from the bordering continents while the ocean was still in it infancy. Vertical movements made by the block appear to have raised it above sea level at some period during it's history. It would therefore seem that there is a lost continent in the Atlantic, but unfortunately for Atlantists, it evidently disappeared long before man appeared on earth. Most scientist remain convinced that there is no likelihood of finding the Atlantis described by Plato in the area of the mid-Atlantic Ridge. As L. Sprague de Camp comments in his Lost Continents, nearly all of the ridge, except for the small and mountainous Azores region, is under two or three miles of water, "and there is no known way to get a large island down to that depth in anything like the 10,000 years required to fit in with Plato's date for the sinking of Atlantis." He also points to a report published in 1967 by Dr. Maurice Ewing of Columbia University, who announced that "after 13 years of exploring the mid-Atlantic Ridge, he had "found no trace of sunken cities." Atlantists reply that Dr. Ewing could have been looking in the wrong places, or perhaps too close to the center of the destructive forces that plunged Atlantis into the ocean. Some Atlantists have suggested that the original Atlantic landmass broke up into a least two parts, one of which sank long after the other. Perhaps Plato's Atlantis was a remnant of the continent that oceanographers now appear to have detected in the Atlantic, and perhaps it was not submerged until very much more recent times. The bed of the Atlantic is, after all, an unstable are and one that has given birth to numerous islands, then swallowed them up again. In 1811, for example, volcanic activity in the Azores resulted in the emergence of a new island called Sammrina, which shortly sank back again into the sea. In our own time, the island of Surtsey, 20 miles southwest of Iceland, has slowly risen from the ocean. Surtsey was formed during a continuous underwater eruption between 1963 and 1966. Cayce is best-known for his apparent ability to diagnose illness even in people whom he had never met. This ability was tested by a group of physicians from Hopkinsville and Bowling Green, Kentucky. They discovered that when Cayce was in a state of trance, it was sufficient to give him the name and address of a patient for him to supply a wealth of information about that person, often drawing attention to medical conditions of which the physicians were then unaware, but that subsequent tests on the patient proved to be correct. This work alone would appear to justify the description of Cayce as America's most talented psychic. And if one aspect of his clairvoyant powers could prove so successful, it seems reasonable to give a fair hearing to other psychic statements he made, however, fantastic. "It would be very easy to present a very tight evidential picture of Edgar Cayce's psychic ability and the helpfulness of his readings if we selected only those which are confirmed and completely validated. This would not be fair in total, overall evaluation of his life's work. My brother and I know that Edgar Cayce did not read Plato's material on Atlantis, or books on Atlantis, and that he, so far as we know, had absolutely no knowledge of this subject. If his unconscious fabricated this material or wove it together from existing legends and stories in print or the minds of persons dealing with the Atlantis theory." "unless proof of the existence of Atlantis is one day discovered, Edgar Cayce is in a very unenviable position. On the other hand, if he proves accurate on this score he may become as famous an archaeologist or historian as he was a medical clairvoyant." If, as his sons and thousands of followers believe, Edgar Cayce's readings were supernormal and not the product of reading the works of others, it is certainly an intriguing case. There are, for example, some fascinating similarities between Cayce's descriptions of Atlantis and those of occultists such as Madame Blavatsky, Rudolf Steiner, and W. Scott-Elliott, including references to the Atlanteans telepathic and other supernormal powers, their advanced technology, their moral disintegration, and the civil strife and misuse of their powers that finally caused their demise. Cayce's readings also mention Lemuria, or Mu. Either Cayce was psychically readings the works of these earlier writers, or he - the they - really were 'tuning in' to the past. The persistence of the Atlantis legend is almost as intriguing as the lost continent itself. What is it that keeps the Atlantis debate alive? Is it a longing for reassurance that men and women once knew the secret of happiness, and really did inhabit a Garden of Eden? Is it the thrill of the search - the hope of finding a master key to unlock the secrets of the past? Or is it simply man's thirst for mystery itself - for something grand and inexplicable, larger than himself? Certainly popular interest in the mystical side of Atlantis is always most intense when the life of the spirit is in the greatest disarray - during the latter half of the 19th Century, in the aftermath of Darwin's bombshell, for example, and during our own time. The day may yet come when the key is found and the mystery of Atlantis is solved once and for all. The solution may be simple or complex. It could be sensational or disappointingly dull. We may already suspect the answer, or it may surprise us. Either way, it would rob the world of one of its most fascinating enigmas. Atlantis has intrigued and inspired people for a very long time. Perhaps, for the time being, we should be glad that the answer has not yet been found, and that Plato's lost continent remains just beyond our grasp.